Samsung announced a new partnership with Six Flags, the world’s largest regional theme park company, last year which appointed Samsung as the “Official Technology Partner” of Six Flags and also brought the first virtual reality roller coasters to North America powered by the Gear VR. The two companies have now announced their renewed collaboration on virtual reality roller coasters. Samsung and Six Flags have teamed up to offer a one-of-a-kind mixed reality experience. 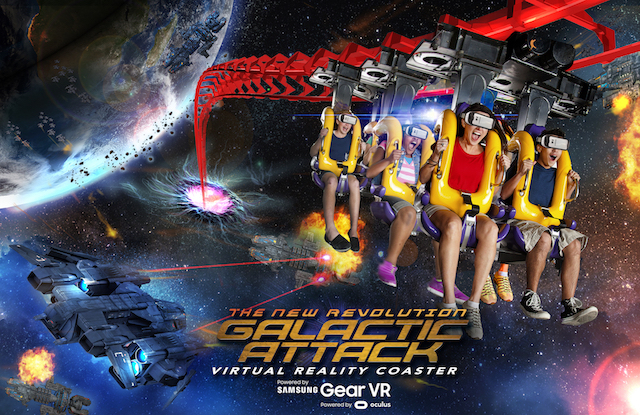 The latest VR ride is called The New Revolution Galactic Attack and attendees will have to wear a Gear VR for the entire duration of the ride. Attendees will get to experience the device’s passthrough camera functionality which will instantly make them aware of their surroundings as they will be able to see the real world, including the person they’re sitting next to, along with virtual content. During the ride they will see a heads up display overlay on the passthrough camera view that will show data like time codes, fuel cells, current status of weaponry and a countdown clock. As they drop at high speeds, the mixed reality view will change to a completely immersive, virtual reality experience in which they find themselves inside a fighter spaceship cockpit and take part in a space battle as they come under attack from laser-firing drones and missiles. You might think that all of this is an invitation to puke all over the place but Six Flags says that the ride is synchronized to the graphics so attendees shouldn’t feel any more motion sickness than they would on a normal roller coaster. The New Revolution Galactic Attack makes at debut at Six Flags Magic Mountain, near Los Angeles and Six Flags Discovery Kingdom, near San Francisco. Since the 2nd of February it is also available in Six Flags Mexico City.